There are two methods of laying mosaic, known as the Italian and the Roman methods. The Italian method consists of building up the design in sections on strips of paper, each cube of coloured marble or glass being gummed in its correct place, face downwards, as part of the design. The whole is then reversed on to the prepared bed of cement, and the paper removed and grout run into the interstices and smoothed up. The Roman process is to press each cube in its proper position by hand into the mastic. It gives far greater scope to the artisan who is skilled and artistic by nature or training, and is costly, but it is also eminently satisfactory. There are several materials which can be used for mosaic. Those most commonly employed being small cubes of marble or glass. Marble mosaic is generally used on floors and brought to a perfectly smooth surface, while glass mosaic is more employed on walls and ceilings, the glass being made in thick sheets by casting, and then broken up into cubes, the fractured surface being exposed in preference to the face, excepting in the case of gold and silver, which are sandwiched between two films of glass. The glass cubes are much better if they are not regular, either in shape or size, so as to catch and reflect the light in all directions, and they can be made in an infinite variety of rich colour. 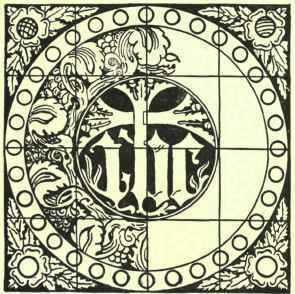 An illustration of this is given in Plate VIII., which represents a glass mosaic panel in St. Alban's Church, Streatham Park, designed and executed by Messrs. J. Powell & Sons, of Whitefriars, E.C. In preparing the walls for mosaic one of the best systems at present developed is that of Mr. J. Bridge, of Mitcham, which is based upon the old Italian methods. The walls are first prepared with several washes of oil, but they may not absorb moisture from the mastic into which the glass fragments are embedded. This mastic is prepared from putty, specially modified by various ingredients, and after it has been laid on the required design is traced upon it by a pricking process, and lightly sketched in. The glass fragments are then pressed into the mastic, which shows between the joints. The process is now being used in the new Roman Catholic Cathedral at Westminster with good effect. It is quite possible to combine in one design both marble and glass mosaic, and even mother-of-pearl and other substances may be introduced occasionally. A panel may also be built up with the figure subjects painted upon opaque glass tile, and the background formed in mosaic, the "tiles" in such a case being irregular in shape, like the sections of stained glass in a window. This work, known as "Opus sedile," is now deservedly popular, admirable opalescent effects being possible in it. Imitation mosaic pavements can be made by casting marble chippings, with a cement backing, in square moulds, and laying them as tiles; while a form of flooring called "terazzo" consists of marble chippings spread on a cement bed and rolled in, being worked by hand at the various angles to produce the necessary finish, while borders are formed by rules marked round the required space. Patterns can be worked by inlaying a template of wood, cut to the shape of the ornament and removed as soon as the body of the terazzo has been laid, the space being afterwards filled in or inlaid with coloured terazzo after the ground has properly set. There are several more modern and economical forms of wall linings, but they are rarely used in high-class work. The chief of these are those known under the names of opalite, muralite, etc. These are thin sheets of opaque-coloured glass, forming a veneer on the wall. It is possible by means of them to obtain beautiful effects, but as a rule their use is limited to the bathrooms of ordinary houses, and to butchers' and fishmongers' shops. Extreme care must be taken to form an absolutely level surface upon which they can be laid, as otherwise the glass will star or come away from the cement by which it is fixed; but in all cases the glass is so thin that it takes comparatively little to damage it. Quite recently metal sheets have been introduced with the same object, enamelled to represent tiles, for which they form a cheap substitute, useful in temporary structures. It is perhaps somewhat beyond the scope of the present book to go into the question of suitable colouring and decorative forms. This must depend to a very large extent upon the taste of the designer, but the careful selection both of pattern and colour before the work is commenced cannot be too strongly advocated. This should be done on the spot, the whole scheme of a room or hall being considered at the same time and not worked out piecemeal. It is quite possible to place a floor in the hands of one manufacturer, with the wall-lining, the ceiling, and the decorative painting each given to different men instructed at different times - with the result that, while each produces first-rate work, the whole effect is most inharmonious.